It’s make or break time – you know you’ve got to make an impressive display, but you’re not sure what to do. You’ve got to wow them, but you’ve got a tight budget and aren’t sure quite what to do. I remember the first time I lit a rave for a client I have. I honestly didn’t even know what the event would be like, nor did I know the best fit for gear. All I knew was that I’d need a solid punt page and snacks for the 8 hours at the console! As we got into the show, I discovered that ravers really like strobes. And then I found the balance between lighting the DJ and various dancers with the dance floor. It resulted in a really fun show where I learned a ton – and then made the next year much more awesome! Lighting a club show is really fun if you prepare right, but can be disappointing if you don’t. Let this page be your guide as I walk you through the basics you need to know in order to light a rave or EDM show in a club or festival environment. When you’re lighting a rave, it’s a lot like lighting a lot of other things. The main purpose is to follow the energy of the DJ, and to amplify what they’re doing, just like the PA system amplifies them musically. When done right, great rave lighting really enhances the mood, amplifies the energy and givers ravers a great time. When done poorly, both quiet and dynamic moments are ruined by lights completely out of sync. DJ’s, EDM acts and ravers all love one thing – energy – have I emphasized that enough already? Because the rave is all about the energy, it’s important to choose lighting that allows you to maximise the energy of the music. Conventional lights are the least useful tool in EDM lighting, but not totally useless! Since they don’t allow you to strobe and flash them really, really, fast and don’t change color, conventional lighting is best for adding in splashes of light here and there. You can use the warm glow that conventional fixtures so nicely possess on big, heavy beat hits and as an occasional source of energy. However, you don’t want to be flashing conventionals constantly, as they’ll get boring and lose their energetic power. You can also use conventionals to light your talent onstage, since most of the time you’ll just keep them in one or 2 colors. LED fixtures are great for rave lighting because a) they change color and b) they’re highly responsive to instant touches, strobes and chases. You can use LED’s pars and striplights everywhere to light the talent, the audience, the backdrop, the venue and anything else you can possibly think of. LED’s are the workhorse instrument of great rave lighting. Moving Lights are perfect for creating energy and keeping the pallet exciting and fresh for a long night’s party. Because of their ability to be static or move, they have a high amount of dynamic range, which is essential to making an exciting light show! If you have a decent-sized budget, putting most of it into moving heads is a no-brainer! When buying moving heads for a rave, club or EDM show it’s important to buy the fastest fixtures you can find! LED-based movers tend to be the most lightweight and fastest, followed by beam fixtures which shoot out an exciting, parallel beam of light! Lasers can absolutely punch through the darkness with their scanning beams of light. 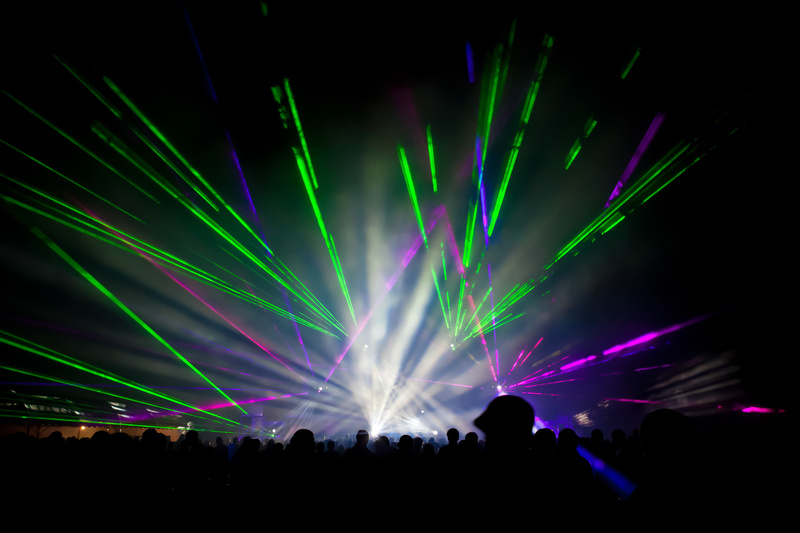 Though many lasers require a variance from the FDA to run in the USA, companies like Chauvet make variance free lasers that are perfect for smaller setups! If you need a bigger laser, check with X-Laser for options – they’ll even help you apply for your variance! A rave wouldn’t be a rave without some haze, or atmosphere for the lights beams to catch as they chase across the room! Even if you only have a few lights, getting an inexpensive hazer to go along with them is a no-brainer – it’s essential for any DJ-based show! Check out my complete guide to haze and hazers right here! And then check out jet-foggers right here for a cool, pyro-type effect without the danger. Last, but so far from least, it’s important to have great control over your lights. As we’ll get into in the next section, a versatile controller with a great operator behind it can make a $500 set of lights look like a $50,000 rig of lights! The opposite is also true if you don’t have proper control over a much nicer lighting rig. I’ve written a number of posts on choosing a light console, because it’s a very in-depth topic. Your needs for a console really depend on the size of your rig. When in doubt, with EDM and rave lighting it’s best to buy a console that’s a little bit overkill for the rig you have. You’ll really be able to make your rig shine and have more flexibility and better looks than if you cheaped out and can’t use your lights to their full potential. The biggest, most important part of rave lighting is the energy. It doesn’t matter if you have moving lights, LED’s, or just conventionals, getting movement and action is the most important part of the lighting designers job. As I mentioned above, your choice of console is very important in this scenario. Let’s first go over why it’s important to not use sound-active mode! Sound-active mode is a cop out for getting a decent lighting operator behind the desk. But I’m not just saying that to keep people employed. When you put your fixtures in sound active mode, they’ll match the music about 60-70% of the time –not bad, right? The only problem is that the other 30-40% of the time, the lights are being completely inappropriate – flashing, strobing and dancing around during very slow portions and not doing a darn thing when the music is at it’s most energetic level! Even if you just have a small lighting rig, paying a musician or another DJ to feel the music and play around with the lights will look infinitely better than leaving the fixtures in sound-active mode. And if you’ve got a big enough rig to warrant hiring a lighting designer, the amount of value someone good can get out of a lighting rig can multiply the value of even a cheap lighting rig. What Lighting Console Should I Buy?